We made Bourbon Vanilla Ice Cream yesterday and it left us with 5 egg whites. Perfect number for make some meringue cookies. If you want a smooth, uniform appearance, sift the cocoa. I don’t because I enjoy biting into tiny spots of intense chocolate. Preheat oven to 220 degrees F. Place parchment paper on two large rimmed baking sheets. Make sure the bowl and whisk are well cleaned and dry. Place egg whites, salt and cream of tarter in the bowl. Starting on low and slowing increasing the speed to high, mix well. Once soft peaks form, begin adding the sugar in 1/4 cup increments. Once the mixture is thick and shiny and stiff peaks have formed, fold in cocoa and vanilla. Move mixture into a piping bag. I use a gallon plastic bag and cut off a little of one of the bottom corners. 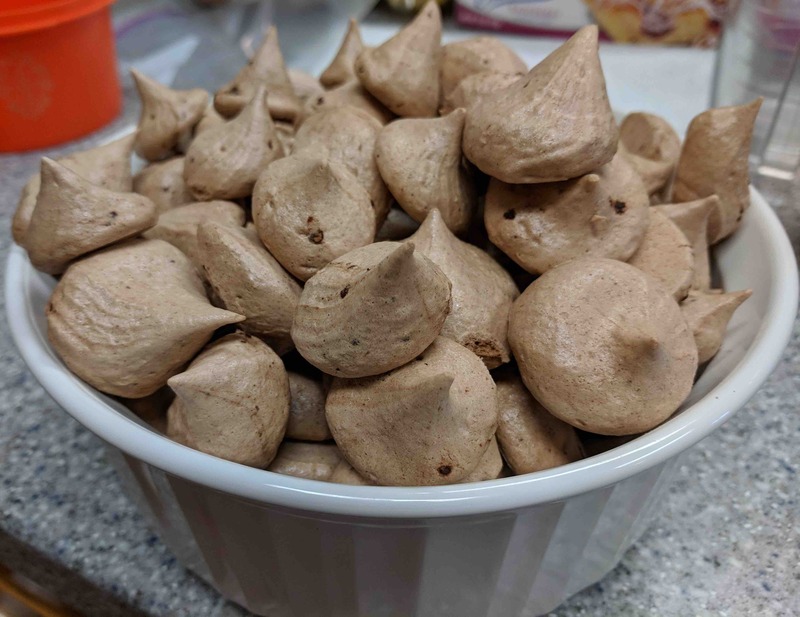 Pipe out drops or other shapes with the meringue mixture, twisting the bag as you go to keep pressure up. Bake for one hour. Turn off oven but keep door closed and let cookies cool completely for 90 minutes to 2 hours, depending on how humid it is. Peel the cookies off the parchment paper and store in an airtight container.